Louisville, KY (June 5, 2013) – Summer vacation may be only beginning for most students, but that doesn’t mean Kentucky Farm Bureau’s (KFB) emphasis on education is slowing down. Ninety-four high school juniors from 60 counties across the state have accepted invitations to attend KFB’s 28th annual Institute for Future Agricultural Leaders (IFAL), held in two locations this month. IFAL is a unique five-day summer leadership conference that highlights a variety of careers in agriculture while exposing high school students to a preview of college life. Participants were nominated by their county Farm Bureau board of directors with the assistance of school personnel and youth group advisors. IFAL students are among the top in their class, plan to further their education at the post-secondary level and have an interest in pursing a career in agriculture. During the week-long IFAL conference, attendees will gain a better understanding of the nature and needs of the agriculture industry, see how basic and applied science is utilized in agriculture and learn of the political process used to develop agricultural policy. Participants will engage in team-building and recreational activities, attend classes and hear from speakers focusing on the values of leadership, social, communication and motivational skills, and visit research farms and other agriculture-related industries. The entire experience is wrapped in a college atmosphere as the students live in dormitories, eat in university dining facilities and become acquainted with life on a college campus in general. To provide conference participants with a small-group atmosphere and greater ability to learn and engage in the activities planned, IFAL is split into two identical sessions. The first is held on the campus of Murray State University, June 16-20, and the other is hosted at the University of Kentucky, June 23-27. "We co-host the Institute for Future Agriculture Leaders as a way to promote ag related careers and leadership development skills to Kentucky's high school students," said KFB Young Farmer Director, Stacy Lowe. "Through our program, participants have the unique opportunity to explore college life, visit local agriculture businesses and engage in several exciting and educational activities." The 46 participants attending IFAL at Murray State University include: Marissa Barnes and Alana Pack, Anderson County; Alex Skidmore, Bullitt County; Spencer Coleman, Butler County; Caleb Brannon, Calloway County; Taylor Grider, Cumberland County; Jacqueline Evans and Emily Warren, Daviess County; Coleman Stivers, Fayette County; Tiffany Muse, Fleming County; Carson Cline and Anna Curlin, Franklin County; Kayla Harrell and Morgan Shoemaker, Grant County; Isaac Logsdon, Grayson County; Vasi Wilk, Hardin County; Jacey King and Luke Watson, Henderson County; Aaron Lynn, Hopkins County; Caleb Slone, Johnson County; Kyle DeVary, LaRue County; Thomas Poole, Rachel Simmons and Savanna Woodall, Logan County; Claire Waggoner, Marshall County; Kayla Ferrell, McCracken County; Kelsie Bewley and Alicia Lee, Meade County; Megan Ballard, Menifee County; Dustin Stewart, Mercer County; Amanda Arnett, Patrick Campbell and Cassie Lansdale, Montgomery County; Ashley Norman and Kyle Schenck, Nelson County; Georgia Kate Ray, Oldham County; Gared Dalton, Russell County; Janna Rae Cline, Scott County; Briana Fellows, Shelby County; Bryce Phillips, Todd County; Daniel Ingram and Mary Elizabeth Roeder, Trigg County; Hannah Adamson and LeAnn Mackey, Union County; Brooklyn Shaw, Warren County; and Rachel Glass, Washington County. 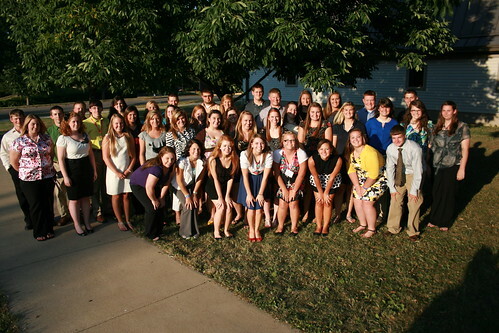 The 48 participants attending IFAL at the University of Kentucky include: Kathrine Ditmore, Allen County; Colt Litkenhus, Anderson County; Zoni Copher, Bath County; Dusty Mallory, Bourbon County; Tori Conley, Boyd County; Devinann Gibson, Boyle County; Owen Bell, Bracken County; Ben Anthony and Elizabeth Hinton, Breckinridge County; Brice Whittington, Caldwell County; Erica Rogers, Calloway County; Lacee Crail, Campbell County; Chip Ellis II, Christian County; Taylor Hudson, Fayette County; Michael Hudkins, Franklin County; Tori Young, Gallatin County; Ally Barnett, Harrison County; Will Metcalfe, Hart County; Ashley Craigmyle, Henry County; Brandon Clark, Hopkins County; Courtney Riggs, Jefferson County; Jonathan West, Knox County; Austin Stillwell and Sarah Stults, LaRue County; Brooke Spillman, Lawrence County; James Kash, Lee County; Josh Boggs and Dylan Burton, Letcher County; Kaitlynn Brown, Logan County; Cody Grove and Jordan Stone, Lyon County; Austin Cooper, Madison County; Samantha Garrett and Anthony Mattingly, Marion County; Alex Housman, McCracken County; Cody Pryor, McCreary County; Chet Flaherty, Meade County; Austin Hazelwood, Mercer County; Natalie Davis and Mary Madison Lyons, Monroe County; Michael Lacy, Morgan County; Darilyn Browning and Tyler Goodlett, Spencer County; Katelyn Carter, Taylor County; Nathan Cherry and Ethan Turley, Warren County; Stephen Carney, Washington County; and Kullen Floyd, Webster County. For more information about the IFAL program, visit kyfb.com/federation.